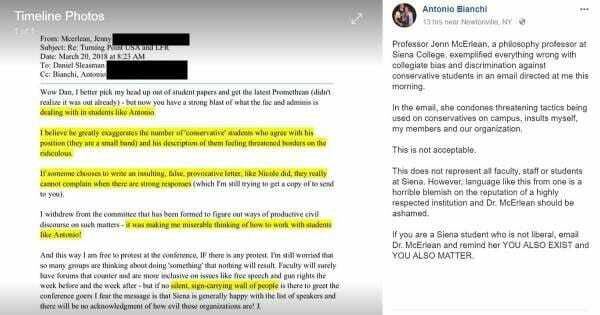 A student at Siena College in New York is currently under investigation and facing charges of “adverse conduct” for putting up print-outs of a professor calling Conservative students “miserable to work with” around his campus. 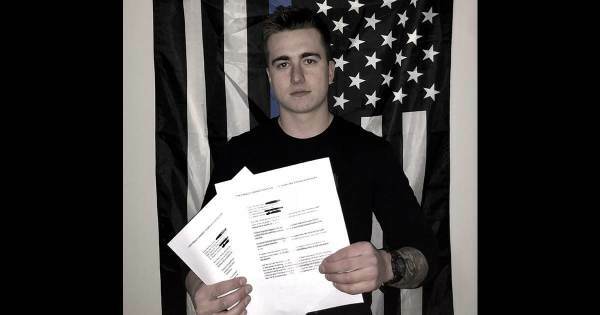 Zachary Butler, worked with a friend to post 600 copies of the email sent by professor Jenn McErlean up around the school. “Eleven days later, on April 2, Butler was served a ‘Notice of Charges’ that claimed his flyering efforts have ‘adversely [affected] the health, welfare, and/or safety’ of campus community members ‘or the name and/or reputation of the College,’ and that he also violated the school’s posting policy,” Campus Reform reports. Butler does not dispute that he violated the posting policy, but refutes the rest. “What I would like to know is how my peaceful protest of posting screenshots of an email that was already publicly available around campus in any way adversely affected the health, welfare, safety, or reputation of this institution,” the political science major told Campus Reform. According to the school’s Student Life Handbook, his penalty could be suspension, expulsion, withholding of his degree, probation, a fine, his parents being notified or a transcription notation.